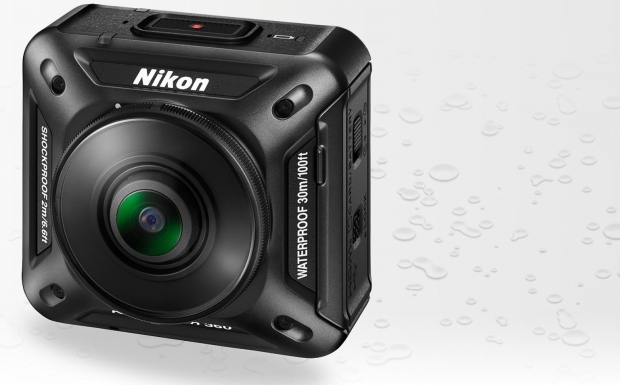 At CES this week, Nikon debuted their first in a range of action cameras to compete with the likes of GoPro and Drift. We’re not sure how useful the 360 view will be on a helmet cam though. The first in this lineup is the KeyMission 360 — a wearable action camera capable of recording true 360° video in 4K UHD. Bringing these different streams of highly relevant technology together in one camera brings an important and timely step-change to the market, which has had limitations in achieving true 360° video recording and making this widely available to consumers. The KeyMission 360 features an image sensor and lens combination on two opposite sides of the camera, and images from each are combined in-camera to create a single realistic, high-definition, 360° image. The camera itself is waterproof to depths of 30 meters without a separate housing, and is also very tough, standing up well to dust, shocks and low temperatures. In addition, reliable electronic vibration reduction, enabled via applications during playback, reduces the effects of camera shake, producing sharp and crisp movie quality. It has been designed for a variety of challenging conditions typical of the action camera market, while ensuring maximum ease of use and freedom of movement to facilitate a wide spectrum of outdoor sporting and leisure activities. The KeyMission 360 — the first of Nikon’s range of action cameras — along with a variety of dedicated accessories, will be released this spring, although no pricing has been announced yet.